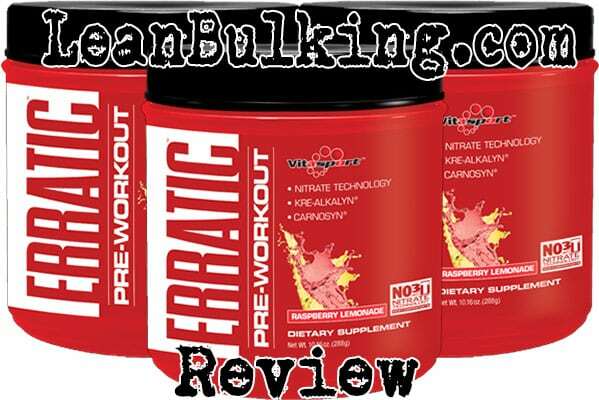 Erratic Pre-Workout Review | By VitaSport | Ingredients | Side Effects? 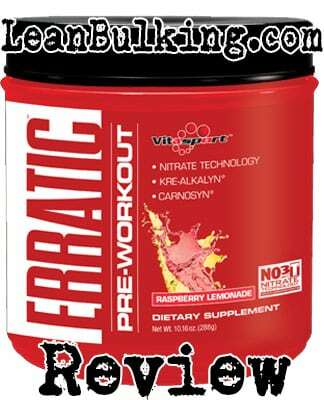 Erratic is a pre-workout supplement by VitaSport. It comes in 40 serving containers (in Cherry Limeade flavor) and has a good reputation - it's one of the most 'googled' pre-workout on the market! For this reason, we had to take a look and see what all the talk was about. VitaSport is a supplements brand owned by Evochem Nutrition, based in the USA. They market a protein powder and fat burner, but we couldn't find much other information apart from that. One thing we found was the ingredient list for Erratic pre-workout - so let's see how good this is below. The first thing we noticed about Erratic pre-workout's ingredient list, is that all of it's ingredients are part of a HUGE proprietary blend. We hate these blends here, because companies often use them to cut costs while keeping the price the same (and maximising their profits). Proprietary blends are mixtures of numerous ingredients that're only shown to you as 1 overall quantity (in this case, the 'Erratic Proprietary Blend' is 4.8g). This is bad, as you're never shown the exact dosages of ingredients inside these blends - meaning you're at risk of suffering from side effects, especially when these blends contain Caffeine (which Erratic does). 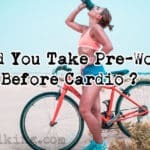 Basically, Caffeine can cause jitters in large dosages (which is the most common side effect experienced after taking bad pre-workouts for this reason). We'll go into more detail about this below. We always have mixed opinions about this ingredient - simply put, it can enhance your muscular endurance, but it also causes paresthesia (See side effects section for more info). We'll cut the bullsh*t and give you the truth - Arginine is ineffective in pre-workout supplements, as it has a poor absorption rate (meaning your body can't make use of it after being orally supplemented). For this reason, Citrulline Malate is the best option for improving your muscle pumps in the gym. We just mentioned that Arginine is ineffective in supplements - well, Agmatine Sulfate is extracted from Arginine (meaning it's also useless in pre-workout supplements). 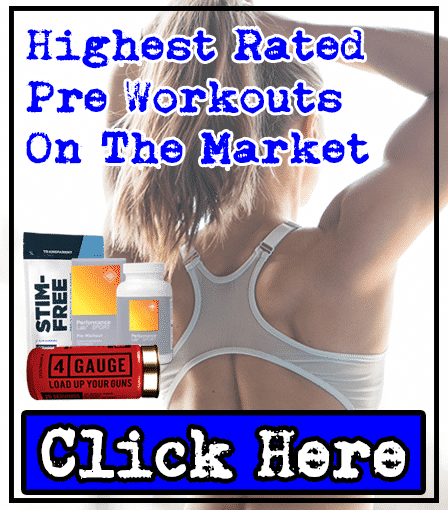 Citrulline is a great ingredient in any pre-workout - it's shown to enhance your muscle pumps, but Citrulline Nitrate isn't the best form (Citrulline Malate is). 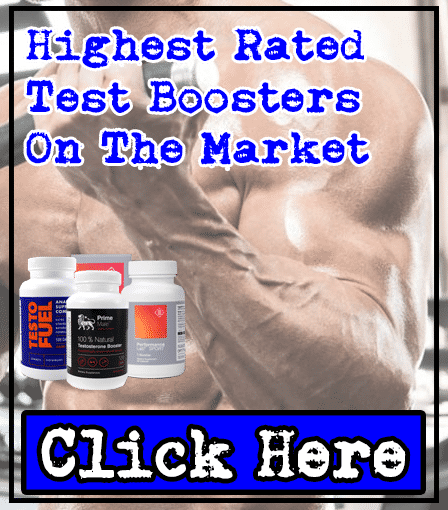 Not only that, Citrulline is only effective in dosages above 6,00mg; as this is part of a HUGE proprietary blend, no-one knows whether there's an effective dosage in Erratic pre-workout. This is considered to be the 'main' BCAA (Branched Chain Amino Acid) and has shown to promote muscle protein synthesis (muscle growth). However, we prefer consuming BCAAs after a workout (protein powders most commonly contain BCAAs for this reason). There are better ingredients that VitaSport could've added here instead, such as Beetroot Extract which has shown to enhance your muscle pumps in the gym. This is an amino acid and neurotransmitter that's shown to enhance your sleep quality - but you don't take a pre-workout to sleep! For this reason, we don't think it's necessary to have Glycine in a pre-workout. Another useless ingredient to have in a pre-workout. Basically, studies have shown that Betaine doesn't offer any benefits - but it causes fishy odors in your breath and sweat (so it's an ineffective ingredient that causes a side effect). This is a 'new' form of Creatine Monohydrate that's believed to be more beneficial than the normal Creatine Monohydrate seen in most pre-workouts. However, no studies have proven that it's actually better than the usual form. The normal Creatine Monohydrate has been used by bodybuilders and athletes since the 1980's (and even helped athletes win olympic medals in the past!). It's proven to work, so there's no need to fix something that's not broken - which is why we'll be sticking to the usual form of Creatine Monohydrate. This is believed to improve your recovery time, but no studies have proven that it actually works. Simply put, it's an unreliable ingredient in Erratic. L-Tyrosine is a great 'brain-booster' that's shown to improve your cognition. But Caffeine offers this same benefit and is in Erractic - meaning there's no need to L-Tyrosine here. 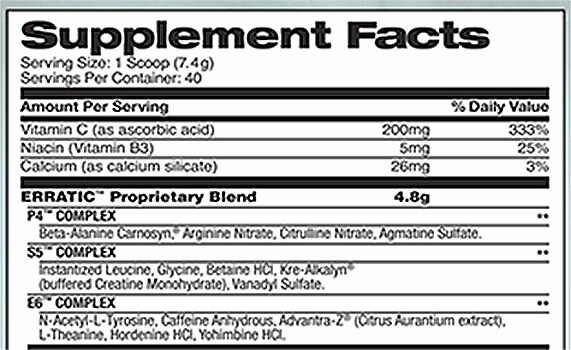 However, L-Tyrosine can play a key role in non-stimulant pre-workouts (which don't contain any caffeine). Also known as Bitter Orange Extract or Citrus Aurantium, it's shown to promote fat loss in supplements. However, it's also been banned in numerous countries (such as the UK and Canada) after causing harmful side effects. We'd had bad experiences after consuming Synephrine, so we choose to avoid this ingredient. This combo of L-Theanine & Caffeine is one of our favorite additions to any pre-workout supplement - it's just a shame that it's part of a proprietary blend, meaning you're not shown the exact dosages of each ingredient inside. Simply put, Caffeine can cause side effects such as jitters and energy crashes in dosages above 200mg per serving in a pre-workout. There's a possibility there's a dosage bigger than this in Erratic, but you won't know until you take it and experience side effects. This is a great example of why we hate proprietary blends - you never know whether you'll be safe from side effects until after you suffer them. 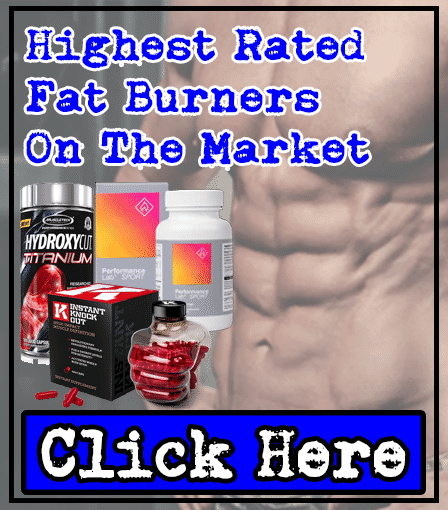 Hordenine is believed to promote fat loss, but it's not proven to work in any study. For this reason, it's another ineffective ingredient in Erratic - the worrying thing is that it's part of a proprietary blend, so it might be filling most of this product (which would make Erratic useless and a waste of money - another example of why we hate proprietary blends). 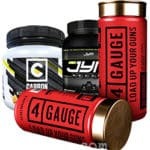 Just when we thought it couldn't get any worse, VitaSport has added Yohimbine...similar to Synephrine, this has been banned in numerous coutries such as the UK and Canada after causing side effects. For this reason, we choose to stay away from Yohimbine too. We probably sound like a broken record player by now, but as all of Erratic's ingredients are part of a proprietary blend - you're at risk of suffering from numerous side effects. The worst thing to put into these blends are stimulants, but VitaSport has added 3; Caffeine, Yohimbine & Synephrine. Although Caffeine is actually one of our favorite ingredients in both fat burners and pre-workouts, it can be harmful in dosages over 200mg per serving in pre-workouts. As it's inside a proprietary blend, no-one knows the exact dosage of this stimulant inside Erratic (meaning you might experience jitters or energy crashes). 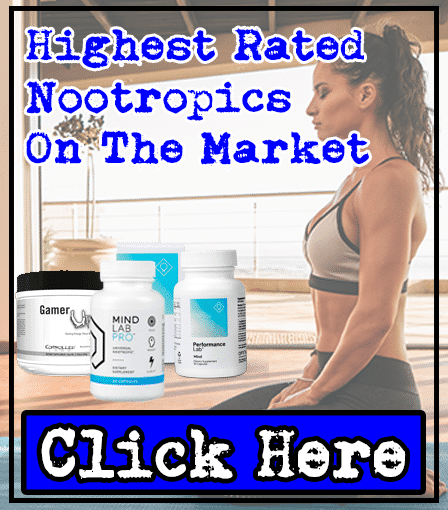 As for Yohimbine & Synephrine, we've already mentioned that they're banned in the UK and Canada for good reason - they've both shown to cause unwanted side effects. The least worrying side effect is caused by Beta-Alanine (paresthesia). There's a chance you're here to see what this is, so we'll explain below. Paresthesia is a tingling sensation on the skin of your face and body (most notably your fingertips and toes). It's not life threatening, but it made us uncomfortable enough to leave the gym and go home. As you can see from the list of potential side effects above, we can't recommend you to try this pre-workout. We hate to see every ingredient inside proprietary blends (as companies use this to cut costs while keeping the price high). Basically, if you don't know whether the ingredients are dosed optimally, then you'll never know whether it's good value for money. Personally, we prefer to know exactly how good a supplement is before we buy it - something that proprietary blends don't let you fully analyze. In our honest opinion, Erratic can’t compete with our favorite pre-workout supplements on the market. Basically, it’s missing key pre-workout ingredients, and it’s the ingredients that make or break a supplement like this.